The primary factors driving revenue growth of the global surgical loupes and camera market are increasing incidence of musculoskeletal disorders among dental clinicians. Increasing application of dental loupes in restorative dentistry and endodontic practice is also responsible for the robust growth of the global surgical loupes and camera market. Expansion of dental insurance coverage is also expected to upsurge the growth in revenue of the surgical loupes and camera market. Extended adjustment period contracting use during dental surgeries is anticipated to restrain the growth of the surgical loupes and camera market over the forecast period. Further, surgical microscopes outpacing dental loupes with better technology and ergonomics will also hamper the market of surgical loupes and cameras in low economic countries. In terms of product type, the global surgical loupes and camera market is segmented into surgical loupes, surgical headlights, and surgical cameras. Surgical loupes is projected to remain the dominant segment with a market share in excess of 50% estimated to be held throughout the forecast period. 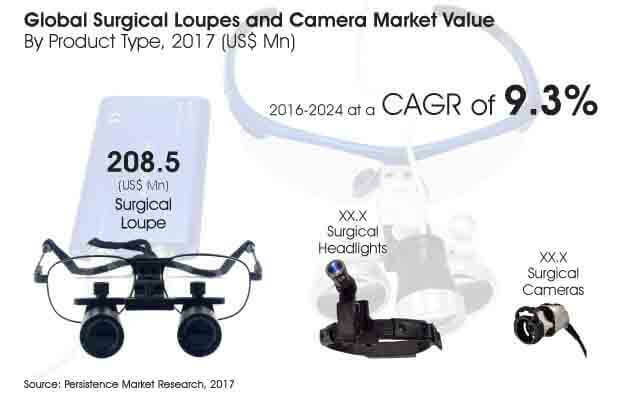 The surgical loupes segment is estimated to be valued at US$ 208.5 Mn by the end of 2017 and reach a market valuation of US$ 410.2 Mn by the end of the forecast period in 2024, registering a CAGR of 10.0% during the forecast period. Through The Lens Loupe (TTL): In the TTL (Through The Lens) system a telescope is inserted into the lens of eyeglasses (fixed position) so that the eyepiece is at an optimal distance from the pupil without the intrusion of other elements. Almost all 2.0X to 3.0X Galilean loupes offer an adequate field of vision irrespective of the distance from the eye. Features include – high customization, optimal weight balance, ready to use, improved depth of field, can be integrated with corrective lenses and lighter weight. Flip Up Loupe: The Flip Up system is a binocular vision device supported by an articulated arm attached to the glasses that allows individual personalization of the user’s parameters. These loupes can also be integrated and used in conjunction with any form of eyeglass prescription including bifocal, trifocals and graduated lenses. Features include – usable by several users, adjustable position of the binoculars, can be worn over prescription glasses, quick delivery of the system, easy to replace, larger blind spot. Galilean Loupe: The design of the Galilean system is lightweight, of simple construction and usually consists of a double lens (a positive objective and an eyepiece lens) making it discreet and lightweight. Galilean loupes come in two designs, through the lens and flip up. Features include – lower magnification, lighter system, immediate adaptability, large depth of field, increased brightness of the system. Prismatic Loupe: The Prismatic system has a high optical quality, consists of a positive objective, a pair of prisms and still a positive eyepiece lens. These are highly utilized during endodontic procedures by providing increased magnification and high quality images. Prismatic loupes are marketed in two designs namely through the lens and flip up. Features include – more complex optical system, high resolution, further enlargements, absence of optical distortion, less depth of field.